Curtain call for Elegy. Courtesy Ririe-Woodbury Dance. Ririe Woodbury’s 2016 Fall Season presented a re-staging of Tzveta Kassabova’s “The Opposite of Killing” (2010) and Jonah Bokaer’s “Fragments” (created for the company in 2014) alongside the world premiere of artistic director Daniel Charon’s “Elegy.” A thread that linked the three works to each other conceptually was how we process events and the subsequent variations on those processes. “The Opposite of Killing,” which Kassabova notes to be about the “absence of a close friend,” presented an extreme on the spectrum of processing. Throughout the dance, the audience experienced little time to do so between sections of the dance and even between choreographic moments. Transitions were abrupt, quick, and often unexpected — making for a sometimes jarring but always fresh and exciting arc as the movement vocabulary and sections unfolded. Dancers repeatedly changed clothing, the color spectrum morphing as a whole for the group, which also contributed to a continual yet unpredictable impetus forward in a multiplicity of identities. Kassabova’s movement language is neither completely postmodern nor dancerly, but a surprising combination of the two. Yebel Gallegos had a frantic solo that was imbued with fine detail in gesture and weight-shift. Daniel Mont-Eton negotiated a contorting solo throughout which he maintained holding of his heels. Gallegos and Mary Lyn Graves had a duet in which she pushed him backward along his knees, the two then quickly shifting into position for him to place her down on the floor in a Pietà-like arch. Moments of unity (all dancing immediately following Melissa Rochelle Younker’s finger snap) bumped up against moments of loneliness (scattered dancing among several lone windmills with spiraling arms). Explosive jumps and lifts (Gallegos tossing Younker up and catching her, all while she was above his head) morphed into reflective moments (Graves in a down pool, appearing to contemplate her relationship to her surroundings). Even transitions between groupings felt uniquely timed within Kassabova’s structure, such that by the time all six ended the dance lying down, it was yet another surprise. The surprise came first in Bokaer’s “Fragments”: the curtain came up on a triangle on the floor created by blinding fluorescent lights, mirrors hung at different heights and orientations throughout the space. The combined effect of the piece’s ambient sound score and restrained choreographic choices was durational, but it felt more like a test to stick it out than a purely-intentioned challenge or question. As an effect of the lights, certain parts of the stage were often or always in shadow. This served to obscure parts of the dance from our fixed viewpoint as audience members; the suspended mirrors also played with obscuring, as in a duet between Graves and Younker where only Graves’ legs were visible from underneath one. Bokaer’s somewhat passive movement language in “Fragments” could be labelled meditative, but I found it frustratingly removed, the dancers appearing deceivingly far away from the proscenium’s fourth wall with no chance of meeting the audience halfway. This could of course be an intentional choice on Bokaer’s part, but I continually felt like I wanted to jump up on stage and wander around the environment in order to give myself some different perspective on the action and landscape. Similar to Kathy Adam’s observation about the piece in 2014, I too felt I could have accessed it better as an installation, free to wander amongst props and bodies and free to check in and out as needed. Bokaer has created abstract bodies doing abstract things (while Kassabova’s may be human bodies doing abstract things), and I craved just a small glimpse of humanity in “Fragments” to draw me into the visually overwhelming, though not completely captivating, world. Charon’s new “Elegy” is my favorite of his creations for Ririe so far, and brought together human bodies doing human things for a powerful conclusion to the evening. The piece was billed as a response to senseless killings, specifically the recent tragic nightclub shooting in Orlando, and it grappled with this subject matter deftly, appropriately, and poignantly. 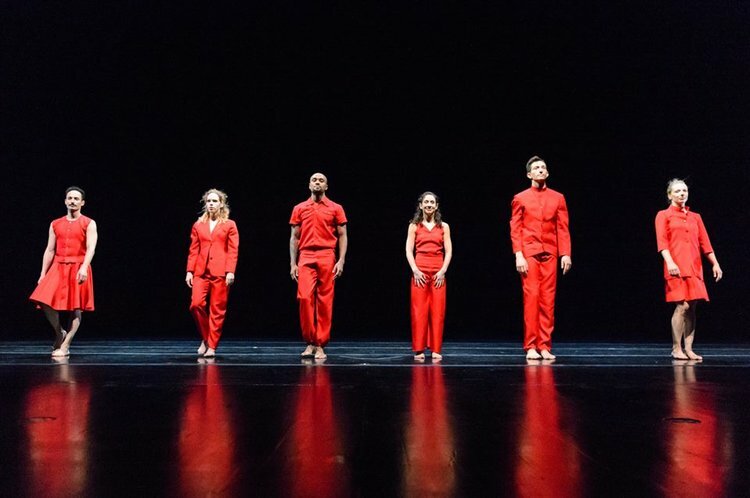 Though the dancers start out somewhat separately, almost creature-like, a palpable connection was present amongst them from the start; I credit this both to Charon’s choreographic/directing skills and also to the finely-tuned instincts of the dancers. This connection, which manifested even when the dancers were not physically touching, drew me into Charon’s work kinesthetically, helping me to ride his wave, where I had felt only stuck in my viewing of Bokaer’s. Contrasting physicalities throughout “Elegy” also aided in this kinesthetic ride: at times, the dancers appeared frozen briefly in amber; at others, they moved continuously through viscous honey. Graves had a great solo that started off with frantic steps, wildly off balance, then morphed into a deliciously suspended, off-kilter arabesque. “Elegy” could perhaps be viewed solely from an abstract perspective and would still be as strong, but it was in knowing the subject matter Charon tackled that I was most impressed. Rarely going into uncomfortably literal territory (maybe only at the very end, where Graves knelt over a completely still Bashaun Williams lying on the floor), the dancers offered honest glimpses into a group experiencing tragedy both together and in different combinations of being alone. A chaotic section had all six grabbing at one another, with scattered looks of confusion, but in an attempt to help or to usher one another to safety. As in this section, the narrative throughout the dance was most often rooted in physicality, not just in emotional content, and the improvisation tasks the dancers did in rehearsals for the piece must have further enabled this transparency through their physical beings. In a Q&A following the performance, Charon mentioned modern dance as a form that “transcends entertainment.” While that may not always be the case, this program specifically succeeded at just that. Important narratives and broad experiences were abstracted and explored in a way that was fully transparent, yet still challenging to me as a viewer. Different versions of these narratives and questions emerged: processing by not allowing time to do so, processing by working through specific surrounding details, not directly addressing something and thus perhaps obscuring it from scrutiny. A young girl asked the final question, wondering if the performers were ever so overcome with emotion that they cried onstage while performing. I think it is unique and special that the artists of Ririe Woodbury transport us so genuinely through the work that they do, and not just through their talent as dancers. 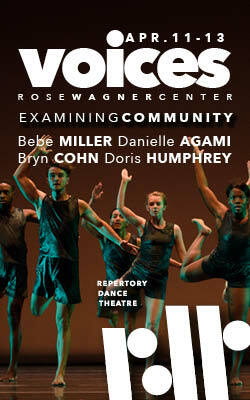 Their ability to participate in dialogue with the community about this work is probably crucial to maintaining a captive audience for modern dance in general, and is helpful at providing additional lenses with which to view such varied and sometimes difficult work. Amy Falls holds a BFA in modern dance from the University of Utah and works as an independent dancer and choreographer in Salt Lake City.